His performing career was punctuated with long withdrawals from public performance, and from 1848 he began to adopt a reclusive life style, while continuing to compose. During this period he published, amongst other works, his collections of large-scale studies in all the major keys (Op. 35) and all the minor keys (Op. 39). The latter includes his Symphony for Solo Piano (Op. 39, nos. 4–7) and Concerto for Solo Piano (Op. 39, nos. 8–10) which are often considered among his masterpieces and are of great musical and technical complexity. Alkan emerged from his self-imposed retirement in the 1870s to give a series of recitals that were attended by a new generation of French musicians. Alkan's attachment to his Jewish origins is displayed both in his life and his work, and he was the first composer to incorporate Jewish melodies in art music. Fluent in Hebrew and Greek, he devoted much time to a complete new translation of the Bible into French. Alkan never married, but his presumed son Élie-Miriam Delaborde was, like Alkan, a virtuoso performer on both the piano and the pedal piano, and edited a number of Alkan’s works. 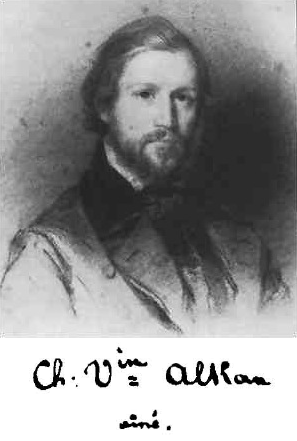 Following his death, Alkan's music became neglected, supported by only a few musicians including Ferruccio Busoni, Egon Petri and Kaikhosru Sorabji. From the late 1960s onwards, led by Raymond Lewenthal and Ronald Smith, many pianists have recorded his music and brought it back into the repertoire. The Wikipedia entry on Alkan provides a more detailed biography as is duplicated here.